How to add spring into your home with decoration ideas, cleaning and a few new spring products to splurge on. Come the end of March, we’re always excited to welcome a new season. Spring is such a breath of fresh air with blooming flowers and sunny skies. As nature does magnificent things outdoors, it’s also a time to re-organize and lift the weight of winter inside your home with colors and flavors of spring. Here’s a list of our top 10 ways to add spring into your home. One thing I love about the holidays is my giant green wreath on the front door. Always a little sad to see it go, but the good news is that there are truly gorgeous spring wreaths you can swap out! Think lemon, lavender, eucalyptus and rosemary are all beautiful herbs and fruits for a spring wreath. This one is inspired by the French countryside. You’ll be able to use it every year. Update your bar cart with flavors of spring. St. Germain Elderflower Liqueur is a great addition to a spring bar cart as you can add it to cocktails, champagne, mimosas and more. It is made with hand-picked spring Elderflowers and turned into a delicious and versatile liqueur. It’s spring in a bottle! We even made a cake inspired by elderflower! Switch out winter scented candles and replace them with a bright, floral spring scent. It fills the house with aromas of spring and flowers. Daybed from Otherland has a scent of peonies, rosebuds and summer greens. These candles burn for a very long time too. I get very excited to switch from flannel sheets to linen sheets for spring and summer! Linen sheets are lightweight, breathable and durable. They’re incredibly comfortable to sleep in as the evenings start to warm up. Parachute has really beautiful organic linen sheets. I keep three sets of sheets to use throughout the seasons, organic cotton, organic flannel and organic linen. I get excited about the little details of a new season, like hand soap! I switch out my hand and dish soap to compliment the scent of the season. For spring lavender is usually my choice! Adding a new doormat or cleaning an old one is important for keeping the front porch clean. Spring is all about welcoming a new season and a beautiful doormat helps with that. This one is from Target and I like it because it’s really thick! Time to dust off the white wine glasses because spring is all about lighter wines! From whites, to rosé to pinot noirs it’s all about sipping something a little lighter and colder. Although there is technically a wine glass for every type of wine, we like to keep it simple with a red and white glass. During the spring, the red glasses get placed in the back of the bar and the white ones come forward. If you don’t have white wine glasses Schott Zwiesel White Wine Glasses from Williams Sonoma are sleek and elegant and made to enhance white wine. 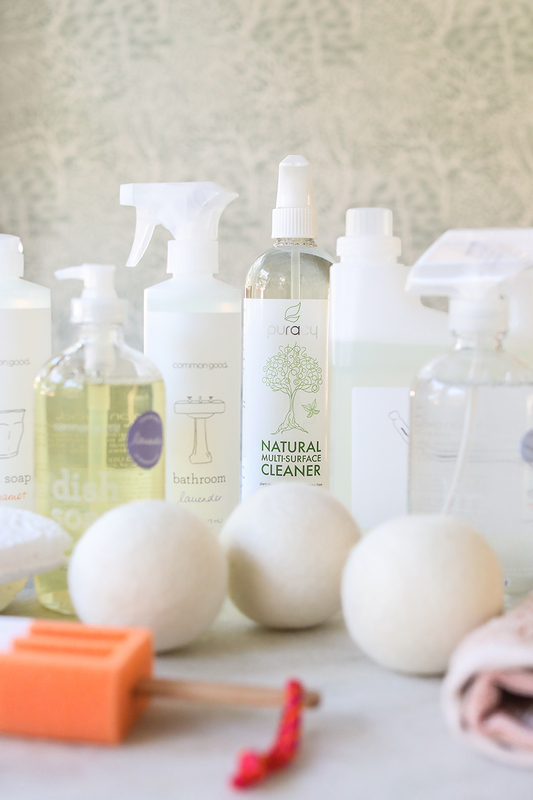 It’s time to look at your cleaning kit and what products you’re using. You want a cleaning kit full of products that are safe for your home and work well. We have covered a lot about cleaning items like How to Create a Charming Cleaning Kit, DIY Natural Cleaning Products, Best Natural Cleaning Products that Work and a Cleaning Checklist you can print. Also, declutter and donate anything unwanted or used. Replace old and broken items. A picnic basket is crucial for spring! It’s our favorite time to pack a picnic and head to the park for a day of sunshine and outdoor play. I absolutely love using a charming picnic basket to hold our food. They’re usually stocked with utensils and even wine glasses and this one has an insulated area to keep food fresh. Picnic baskets can be a little pricey, but usually a one time splurge as you’ll most likely have it forever. Tulips are the signature flower of spring and it’s a good thing because they’re so beautiful! They will last a while if taken care of properly and they’re easy to arrange. You can buy tulips at the grocery store or farmers market. Seasons are to be celebrated and it’s all about the simple pleasures in life. We hope these tips have inspired you to add a little spring into your home! The Big Reveal: My Kitchen and Dining Room Remodel!